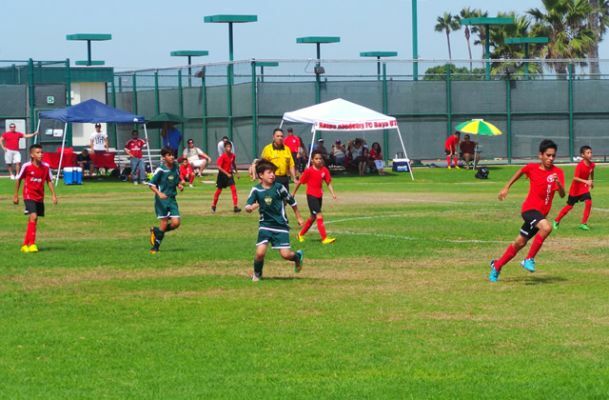 CORONADO –Xolos Academy FC’s Under-13 team scored two second half goals to beat Nado 4-2 in a Week 2 match of the Presidio League Saturday Sept. 13 at Coronado Cays Park. Caled Arzate and Alejandro Sanchez scored two goals each to lead coach Luis Guerra’s team to the come-from-behind win. The Xoloitzcuintles trailed 2-1 at the half. “I’m very proud of this team, they have been playing very well and practicing very hard,” Guerra said. “I’m proud of the way hey came back from a 2-1 (deficit). To score three goals from outside the 18-yard box with shots on the goalkeeper that he wasn’t going to stop was great. We need to keep working hard and keep a positive attitude and we will continue to do well.